In the eastern half of the Waterfall are you'll find the goblin bean washer, Arai Adzuki (which is literally translated from Bean Washer in Japanese). If you can successfully take over his task of cleaning the beans then he'll let you pass by him. The washer is only there during the morning and night times. 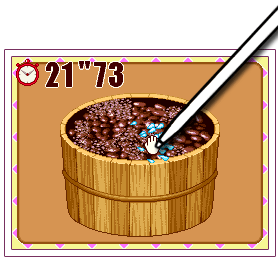 The goal of the game is to clean all of the dirt from the top of the beans. You will have to rub your DS stylus back and forth horizontally across the beans until the specks of dirt dissolve away. You only have 30 seconds to clean all of the legumes! That's how the game is suppose to be played, but it works best if you use the A button and the directional pad. All you have to do is hold down A the entire time while moving the hand around the dirty beans with the pad. The goblin will let you know on the top-screen when you've successfully cleaned the beans. After you clear the game during the story line, you can play it again by going back to the Waterfall and giving the goblin a fish.